What if you could take something you do at work every day, and produce better results in 1/5th the time? That’s what SideBar Reporting can do for you – it makes building selection filters easy and efficient! Similar to travel websites, it enables you to change parameters on the fly to quickly view new information. You can enter filter criteria, view the report, and refresh the report with different criteria without ever leaving the report screen! Plus, you can graph some of this data right there on the screen, instead of exporting to Excel, to gain a better understanding of the data and make better decisions. How much does SideBar cost, and how does it work? The SideBar is included FREE to all DonorPerfect Online customers! It will display after you view a SideBar enabled report on the screen. 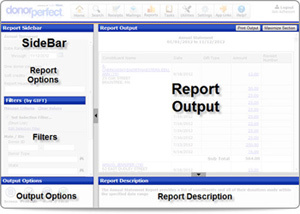 Along the left, you may configure the report options such as the sort order, the Report Header, or other applicable options. Also along the left, you can enter filter criteria directly into the SideBar fields such as Amount of Gift, Date of Gift etc. Then, press the Enter key on your keyboard or the Screen button at the bottom of the screen to view the results in your report that match your filter. Can I customize the SideBar? How does the SideBar combine my different filters and filter criteria? The SideBar will combine all of your criteria using AND (not OR). For example, if you enter a Gift Date range of 1/1/2013-1/31/2013 and a State code of PA, the report will display donors from Pennsylvania who gave a gift in January 2013. If you want to use an advanced Compound Filter or a previously saved filter, this criteria will be combined with your SideBar criteria using an AND as well (Compound filter AND SideBar criteria). How do I search for “begins with _” in a selection filter? Text fields such as First Name, Last Name, or Address already do this by default. If you enter a B in the Last Name field, for instance, it will select all records for which the Last Name begins with a B: Baker, Butler, Bywater, and so on. Which reports use SideBar Reporting? 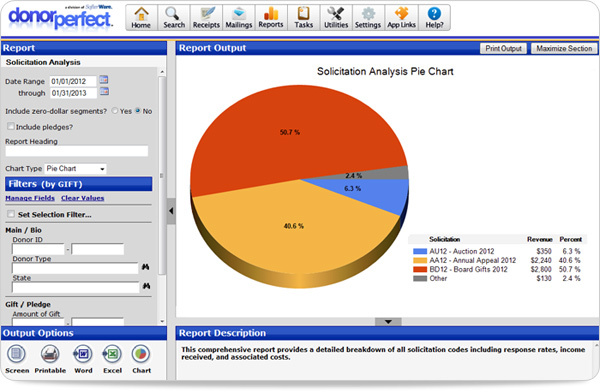 All Listings Reports and Custom Reports utilize the SideBar. Financial reports that use SideBar Reporting are listed with an asterisk ( * ) after their name in the Select a Report list. Click the Print Output button in the top-right corner of the screen. How do I export to Excel and Word? For those reports where this applies, see the Output Options section in the lower-left corner of the screen. Is there a limit to the number of fields that I can add to the SideBar? No! Feel free to add as many fields to your SideBar selection filters as you need.